Andi Alpers is on the verge of being expelled from her Brooklyn prep school when her father intervenes. His price is that Andi spend winter break with him in Paris, where she is expected to work on her senior thesis, a study of famous French composer Amade Mahlerbeau. Any other girl would be thrilled at spending Christmas in Paris, but Andi resents her father for being absent throughout her life, and knows that he blames her for the death of her younger brother Truman. But while staying at a family friend's, Andi discovers a hidden diary dating back to the eighteenth century and in it the story of Alexandrine Paradis, a young woman caught in the cross fires of the French Revolution. Alex's story grabs hold of Andi and takes her through the years, all over Paris, and finally into the catacombs, where both girls' fates intertwine. 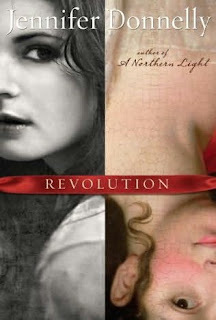 Revolution is a most excellent novel--complicated, brutal, heartbreaking, and striking. While the majority of the book is told from Andi's point of view, Revolution is as much about Alex's story as well. Donnelly brings Alex and the French Revolution alive in her diary, and shows us not only the struggles of the people and their fight for a better life, but also the suffering of the royal family, especially the lost prince Louis-Charles, who didn't deserve the injustices that he had to endure before his death. There are so many elements of Revolution that come together perfectly: Andi's grief and pain over the loss of her brother and her strained relationship with her parents, her research into Mahlerbeau, his mysterious past and why he named his most famous work The Fireworks Concerto, Alex's own life, the time she spent in the catacombs, her devotion to the prince Louis-Charles, and finally the twenty-first century investigation into the genetics of his lost heart. Everything is stunningly played out until Andi and Alex come to the same powerful realization, hundreds of years apart--that life and the world will be brutal and terrible, and no one can ever change that, but they can change themselves, and this revelation is the most affecting revolution both girls can experience. Revolution is a beautiful, meticulously researched, and realistic novel full of music and words that have the power to heal, and the ability to transcend centuries of time. It goes beyond all description, and it will resonate deeply with you. You simply must read it. Cover Comments: I love this cover, it is gorgeous and sophisticated. It blends the twenty-first century image with the eighteenth century one well, and I like how the red ribbon is incorporated, with the key on the spine. It's beautiful. Revolution will be released on October 12th, 2010. ARC borrowed from Shanyn of chickloveslit.com. Oh, it does sound awesome. I agree on the cover. I like this one too. I like the use of the red ribbon to allude to something I always associate with the French Revolution - the Guillotine. There's another cover that does this too - The Red Necklace by Sally Gardner. I never thought of the ribbon being like that, though that's smart! Andi wears a key on a red ribbon around her neck in the story though! This sounds SO good! I want to read it even more now. I am dying to read this. I haven't seen it around as much as other upcoming novels, but it sounds very interesting. Thanks for the review! I didn't like this story. The teen angst was way too thick and I found the circumstances Alex and Andi found themselves in too unbelievable. Too many guys seem to like Andi and want to kiss her emotional (and real) boo boos. She's a rich, misunderstood genius with a tragedy and I don't like characters like that. It's hard for me to feel sorry for them. I like my YA Historical fiction coming from authors like Richard Peck or Libba Bray.